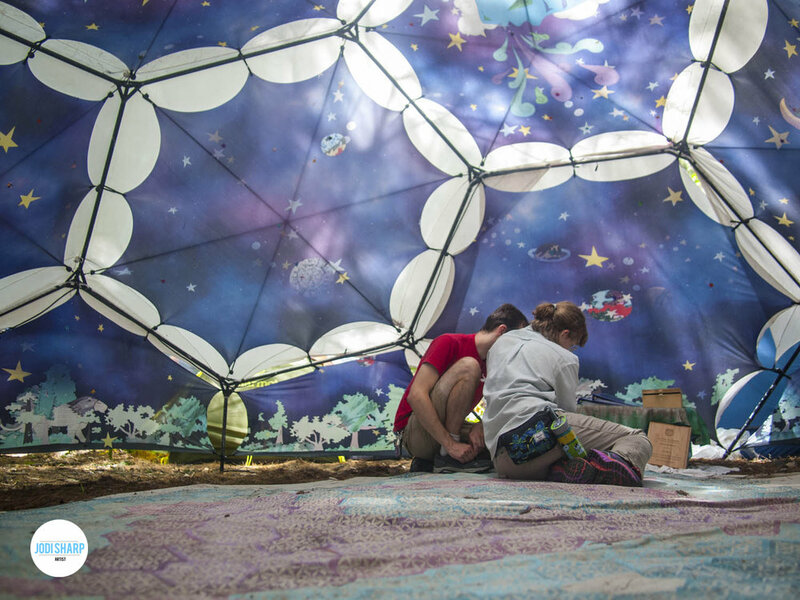 “We Are All Stardust,” is an art dome made by Jodi Sharp that has been touring Eastern Canada and US during this years festival season. Our first ever fully printed custom art dome, the purpose of this project is to recreate a sense of childlike wonder and world building. 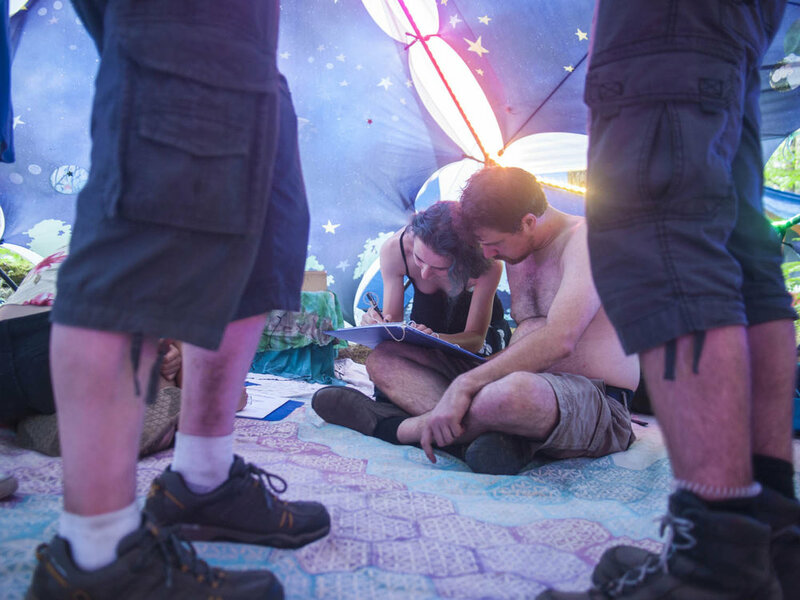 Participants are asked to enter the dome and pick a fabric star that speaks to them. They label it and pin it somewhere in the dome. In the dome are notebooks where they can make up information about the star that they have labeled. They are asked to name a planet in their newly identified solar system, identify the type of lifeforms, languages, rituals, etc. There is space in the notebooks to draw and dream. Each new participant not only names and creates their own idea of a solar system, but is able to find the stars and read about the planets and worlds that other people have already created. The intent of this project is to get people to think about the universe outside of our individual worlds. Instead of a project being introspective and self focused, it is getting people out of the “reality” of their lives to dream that anything is possible. The response by individuals who have seen this on the circuit this year has been truly magical. Having a custom printed dome creates a space that completely envelops the viewer. Instead of the dome being the infrastructure that holds the art, the dome itself becomes the full art piece. The effect is enveloping and adds to the viewers capacity to sink in and experience the art. Although we find the final effect of the custom printed dome stunning, the process of creating this work was quite a bit more than we originally bargained for. When we approach any new project we make educated assumptions about what the outcomes will be. Although this full dome print wasn’t too far off our expectations, there was definitely some learning about the complexities of creating art on an entire dome. To start with, domes are compounding spaces, meaning that each time you make a dome bigger you exponentially increase the size of your panels. The sheer amount of material it takes to cover a dome is so much more than it would take to cover another structure. But one thing we learned was that it wasn’t actually the material cost that became the problem, it was the R&D and setup cost of each individual panel. When you count up the the number of individual “windows” in the dome that need to be covered in fabric, you’re talking about 18-20 openings. While that is a large amount of material, the interesting part becomes that each one of those spaces has to be treated as its own separate art panel. Rather than thinking about the interior of the dome being one full printed piece, you have to look at the orientation and connectedness of each panel individually. Each separate panel has to be photoshopped, orientated and sent to the printers and tested. This means that instead of one photoshop cost and one printer setup fee, you have to times that by at least 18. The file sizes of these pieces are also huge. Because you have to create an image that’s the size of the panel in order to have high print quality, it takes the tech or artist a large amount of time just to be processing the files. This means that the paid work that goes into creating the dome is also extremely high. Finally, the print testing of the panels is another large step in the setup cost. Because all the panels have to flow seamlessly together, you need to make sure that your colour matching is well tested before you print the entire dome. The colour of a print changes slightly depending on the printer, the laptop and the calibration between the two. Making sure that each print will match exactly is extremely important and takes time to get right. The printer will charge you for this extra time. While the beauty of a fully printed dome is sometimes worth the price, the cost of all of these things put together can sometimes be prohibitively expensive. The difference between custom print jobs and fully printed spaces that are reproduced several times is that with custom work the setup and R&D time has to be paid for fully with just the one dome. With manufacturing, once the print is created and set up, the cost of the creation can be priced out into multiple domes which lessens the cost. While we’re more than happy to fully print a dome for any client who asks us, there are also many solutions that can give you the look and feel of a custom dome without the high cost. By having panels that are a repeat pattern or logo that’s the same per every panel, you can individually brand your dome and only pay one setup fee versus several. As well we find the look of only having a few panels printed versus having all all of them, still gives a beautiful and individual look to any dome. While we love the look of a fully individual custom job, we know that there are many solutions available for clients who want the custom feeling without the custom price.